Find the perfect cover for your photo book. This standard cover option is both beautiful and durable. Get a sleek look with durable matte laminate. Add shine with metallic accents on the front and back. Now with personalized metallic fonts. Feature photo in die cut window with high-quality materials. High-quality premium leather cover with stitched edges. Shutterfly's revolutionary new Simple Path makes it easy to create a photo book in just a few minutes. Pick a size, upload your photos and Simple Path will instantly make a photo book for you. It's ready to order or you can quickly change styles, edit photos, add captions. 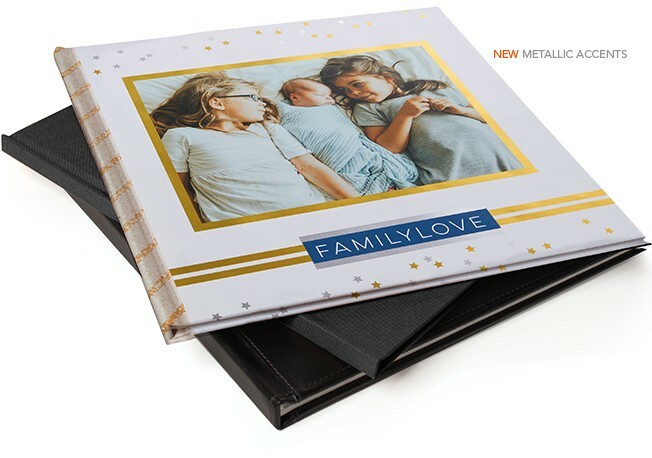 Create personalized baby photo albums, wedding photo albums, travel photo albums and more.